1/4 red onion, thinly sliced. 1/2 red capsicum (pepper), thinly sliced. 1 tin (165ml/ 5 fl oz) coconut milk. 2 tablespoons massaman curry paste*. 2 tablespoons lime juice (about half a lime). 150 g (5 1/2 oz) white-fleshed fish fillet, such as snapper, flake, ling or flathead. 5 snow peas (mangetout), top and tailed and halved. 5 sugarsnap peas, top and tailed. 1/4 small zucchini (courgette), cut into batons. 1 tablespoon coriander (cilantro) leaves. Heat the oil in a frying-pan over medium heat. Add the sliced onion and fry gently for about 3 minutes, stirring often. Add the capsicum and fry for a further 5 minutes. (You don't want to burn the onions, just get them a little brown for their flavour.) Add the coconut milk and curry paste, stirring well to combine and bring to a simmer. Add the lime juice and fish sauce, stirring to combine, then taste for flavour. 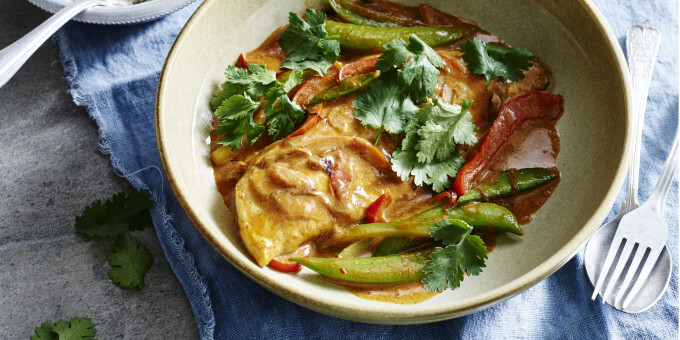 Put the fish fillet in the centre of the pan, scatter the vegetables around the sides , turn the heat down and simmer the sauce gently, covered with a lid. Turn the fish after 5 minutes and stir the vegetables so they are well coated with the sauce. Put the lid back on and cook for another 5 minutes. Turn again and check for doneness. The fish should easily flake apart once it is cooked - and the total cooking time should be between 10-15 minutes, depending on the thickness of the fish fillet. Finish with the coriander and serve with rice. 1 large clove garlic, peeled. 1 x 180 g tin of quality tuna, in olive oil. 1 tablespoon baby capers, rinsed. 100 g wild rocket, washed. Cook the bucatini in a large pan of boiling salted water until al dente. Meanwhile, finely slice the garlic and chilli, then roughly chop the anchovies and tomatoes. 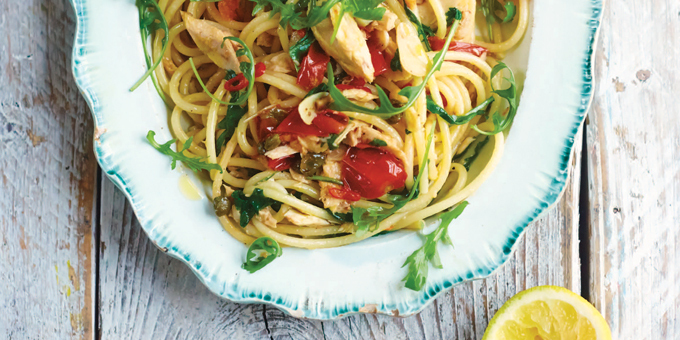 Heat 3 tablespoons of oil (use the oil from the tin of tuna for added flavour, if you can) in a frying pan over a medium heat, then add the garlic, chilli, anchovies and capers. Fry for 2 minutes, then add the tomatoes and toss well. Reserving some of the cooking water, drain the bucatini and add to the sauce. Toss well over the heat until lovely and glossy, adding a splash of the cooking water to loosen, if needed. Flake in the tuna, then add some lemon juice and most of the rocket. Toss well to warm the tuna through and wilt the rocket, then season carefully with salt and more lemon juice. Serve with a drizzle of oil, and a scattering of the reserved rocket. 3 sweet potatoes, peeled and cut into bite-size chunks. 3 beetroots, peeled and cut into bite-size chunks. 500 ml bone broth, chicken or veggie stock. 10 g finely chopped fresh dill. Heat 1 tablespoon coconut oil in a large saucepan over a medium heat for 1 minute, add the onion and saute with a pinch of salt for 5 minutes. Throw in the sweet potato and beetroot and saute for 3 minutes, stirring constantly so nothing burns, then add the broth or stock, and the water. 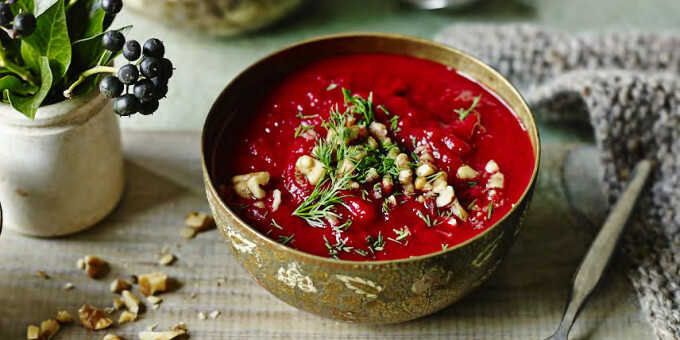 Bring the temperature to a simmer for 30 minutes, puree with a hand blender, and serve with walnuts and dill scattered over. 4 rashers bacon, rind removed and chopped into small pieces. 2 medium potatoes, peeled and chopped into 2cm chunks. 1/2 bunch kale (I like using cavolo nero). 1/4 cup chopped roasted almonds. Divide the diced potatoes in two. Double wrap each amount in foil and place on the fire away from direct flames. Allow them to cook for about 20 minutes, turning them around so they cook evenly. Meanwhile, add the bacon to a skillet. Place on the fire and cook for 10 minutes, flipping the bacon around until crispy. Once cooked, remove from the heat. Add kale, lemon juice, mustard, salt and olive oil to a large mixing bowl. Using your hands, massage the dressing into the kale until it softens. 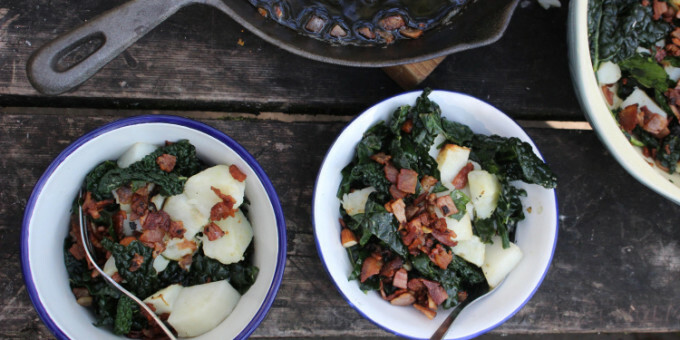 Once potatoes are cooked, place them along with the bacon bits and a good amount of bacon fat from the pan as well as the almonds into the kale bowl. Toss to combine. Serve. * You can make this dish even if you're not camping. Simple Roast the potato in 180ºC oven for 40 minutes until soft and fry the bacon off in a fry pan on medium heat. 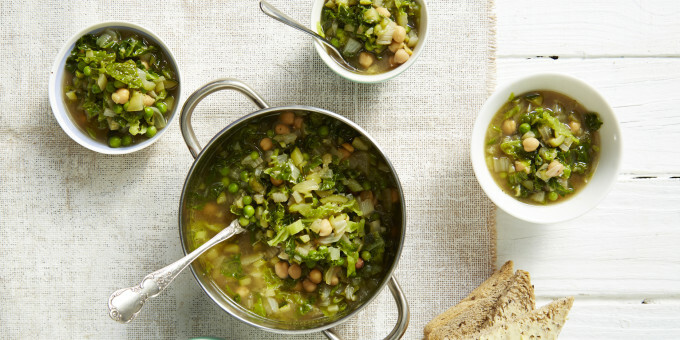 We harp on about the importance of greens and this Minestrone certainly delivers! Not only that, but this recipe comes in at under $2 a serve, so you're getting plenty of dense nutrition for your buck! 1 l chicken or vegetable stock. 1 X 400 g chickpeas, drained and rinsed. 2 cups Savoy cabbage, finely shredded with a knife. sourdough or gluten-free bread, to serve. Heat oil in a large pot, add onion, garlic, celery and zucchini and sauté until tender, about 10-15 minutes. Add the stock and chickpeas, herbs, salt and pepper. Simmer for 15 minutes. Add cabbage and peas, continue simmering for a further 10 minutes. Serve soup straight from the pot with a slice bread, if you like.